She watched as executives took turns with the red sharpie. Each leader picked up the marker and signed a map of the company’s stores across the United States. As the red strokes filled the page, Kindel Elam felt a special sense of pride. As Mattress Firm’s general counsel, she was instrumental in closing nearly twenty acquisitions, including nine deals in fiscal year 2014 that helped the company enter several new markets. Mattress Firm was active in all but twelve states. Elam, who negotiated several acquisitions for Mattress Firm as an associate at Fulbright & Jaworski, became the specialty bedding retailer’s first in-house attorney in 2012. She accepted the position in part because of her faith in the company’s leaders. Mattress Firm—which celebrated its thirtieth anniversary on July 4, 2016—has aspirations to move into all fifty states. Although Mattress Firm has grown organically, much of the company’s expansion has come through acquisition. In fact, Elam’s 2014 was just a prologue to her current work. In 2014, Mattress Firm acquired Sleep Train in a deal reported to be worth $425 million. The acquisition of the company’s top competitor along the West Coast gave Mattress Firm stores in three additional states. The deal netted Mattress Firm 314 stores and helped Elam grow her department: a commercial transaction lawyer and a real estate attorney stayed on, along with two paralegals. The following year, Elam hired a corporate attorney and two additional real estate lawyers while moving one paralegal to Mattress firm’s training department. Today, Mattress Firm—a company with more than $3.6 billion in pro forma net sales and more than 10,000 employees—is backed by a small but mighty legal team of seven. In late 2015, Mattress Firm shared its plans to acquire another competitor. This time, Elam and her colleagues had submitted a winning bid to purchase Sleepy’s at auction for $780 million. As a major player in the northeastern United States, Sleepy’s would again extend Mattress Firm’s geographical footprint. The growing mattress retailer was still digesting its recent acquisitions, but Sleepy’s represented a “can’t miss” opportunity. “We would eventually enter the Northeast one way or another, and the acquisition dramatically sped up the process at a reduced cost,” Elam says. With the papers signed, Mattress Firm turned seven more states red, taking its total to forty-eight. The whole company now has more than 3,500 stores and eighty distribution centers. The sheer size of the combined operation will allow Mattress Firm to reap the benefits associated with national advertising campaigns, combined cost savings, and border-to-border distribution. Additionally, the series of acquisitions will allow Mattress Firm to continue to deliver on its cultural mandate to serve local communities. Mattress Firm works with several organizations to raise money and awareness for foster children nationwide through in-store fund-raisers and donation drives. 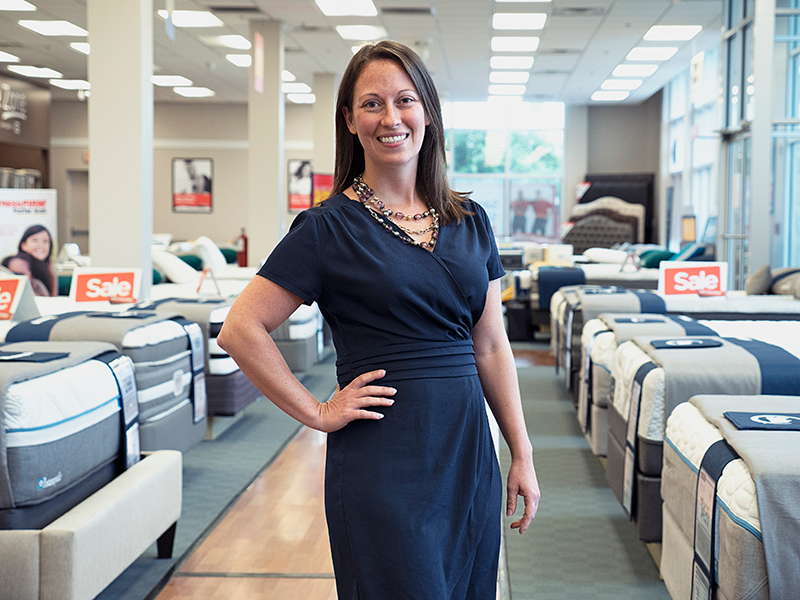 To find success, she advocates for Mattress Firm’s culture but remains open to importing best practices. Soon after each acquisition, teams convert store signs and layouts to the standard Mattress Firm brand. Simultaneously, they shut down stores and bring in the company’s “best and brightest” to lead cultural events and train acquired employees on POS systems and other processes. As the dust from an active era settles, Elam is working to implement some small but significant changes within her department. “We’ve been living in a reactive state, and we want to give our departments more specialized attention,” she says. In 2017, she’ll ask each attorney to support a specific business unit to increase the quality and consistency of legal’s advice at Mattress Firm. Although more acquisitions might lie ahead, Elam’s 2017 will be about refining the legal process. “We’ve added good people to our team, and we need to take full advantage of that by using what they know to help us improve from within,” she says. As the team moves forward, it will continue to support an ambitious and growing company. With a coast-to-coast goal nearly complete—just two states remain—perhaps international growth is on the horizon.